Pay by mobile casino sites in the UK let you deposit money using your phone bill or prepaid balance. There are several online casino mobile payment services and all of them super easy to use. As long as you have a UK SIM card, you can deposit in the pay by mobile casino sites. Pay by phone bill UK mobile casino sites enable online casino deposits using just your phone. No need for a bank account, credit card or any extra hassle. Deposit with your mobile in the best pay by phone bill casinos in the UK. How does mobile casino billing work? Select Payforit or Boku on the casino deposits page. You'll get a text message with the confirmation code. Enter this code to the casino. You'll get a confirmation message after a successful deposit. You can use your phone bill to top up your mobile casino account. If you have mobile phone with a monthly subscription, your pay by phone casino deposits will be added to your next phone bill. If you have a prepaid phone number, you can pay in mobile casino using your phone credit. This is a very secure way to deposit in an online casino, because the prepaid SIM cards are totally anonymous. In addition, by limiting your deposits to what you have topped up on your phone credit, you'll always be on top of your casino spending. What is an SMS deposit? Boku, Payforit and other direct billing methods all confirm your UK mobile casino deposit with an SMS, i.e. a text message. Pay by SMS billing in mobile casino isn't a separate banking method, but one step in the mobile payment process. When you're making a pay by text casino deposit, you need to use the above mentioned payment systems. Which mobile casino games you can pay by phone bill? Simply put, all of them. Ranging from live casino online games to new slots, you can deposit and pay by phone bill to play any mobile casino games available. Why pay by phone in a casino? Pay by mobile phone casinos offer all the convenience you can wish for. This is a payment method designed for anyone, anywhere, to be used any time. Many of the best online casino sites have already adopted it. Why not pay by phone? No withdrawals. You'll have to use another banking option to get your winnings. Low limits. You can only deposit £10 per transaction or £30 per day. Not universal. The smallest mobile carriers don't support pay by phone billing. The major drawback with pay by mobile phone casino banking methods is that you can't use them to withdraw your winnings from the casino. You'll have to resort to another banking method to cash out your dough, and confirm this method by making a deposit and wagering it. 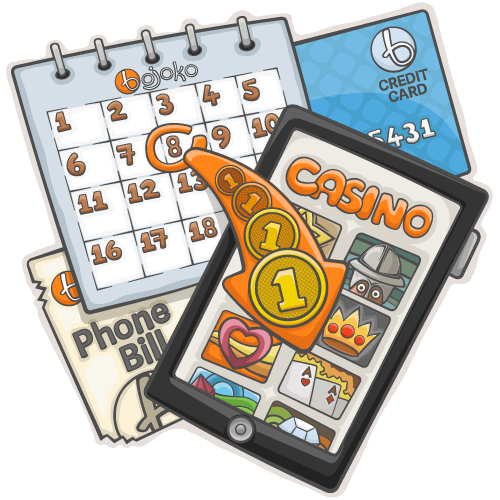 The leading independent mobile payment provider for online casinos in the UK is Boku. Depositing with Boku is easy: just choose a pay by phone option in the casino banking page, enter your mobile number and confirm your deposit amount. 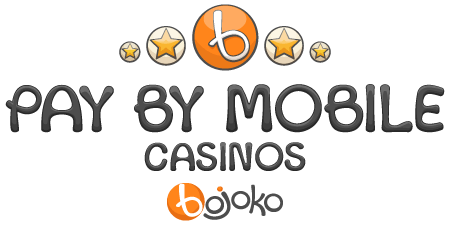 If you've already deposited using Boku in a pay by phone UK mobile casino, your number will already be saved. Find the best mobile phone deposit casino supporting Boku from our selection. You can transfer money effortlessly and focus exclusively on enjoying your gaming experience! Many UK casinos support Payforit, a direct mobile billing method created and adopted by all the major UK network operators. Even though Payforit is the most prevalent direct mobile billing service for casinos, you may find one of the alternative options or even the Payforit method under a different name instead. Apple Pay is quickly becoming the favourite payment method for iOS users all over the world. By these we mean the lucky owners of the latest iPhones, iPads and Apple Watches! Apple Pay is extremely convenient to use at store checkout points as it basically acts as a scannable digital wallet, doing what credit and debit cards do but with highly improved technology. The feature pulls your cards' data from the app to make instant, secure mobile phone casino deposit with your device. Apple Pay scores some major points due to its unique feature. You can withdraw money from your player account with Apple Pay, unlike with other online casino mobile payment methods. Use Apple Pay if you have the latest Apple tech and want to deposit and withdraw in online casinos with just one sweeping tap. Instant banking: Choose a service like Trustly, login with your online banking details and top up your casino account instantly using your mobile phone. Credit and debit cards: Complete the transaction in your smartphone's browser. You can even save the card details to save yourself some hassle in the future. E-wallets: Log in to Skrill or Neteller and you'll be able to transfer the funds stored in your e-wallet in just a few easy-to-complete steps in your player account dashboard. PayPal: Online casinos that accept PayPal let you deposit in a single tap with PayPal One Touch. Skrill has also rolled out its 1-Tap feature too. Here's our list of casinos with pay by mobile phone casino banking options (not Boku). We've left this payment method out so you can easily sift through the other options. You only need your phone to deposit and play in these pay by mobile casino sites.